This year, we are celebrating the centennial of the organization of 7 of Wyoming’s 23 counties: Campbell, Goshen, Hot Springs, Lincoln, Niobrara, Platte and Washakie Counties. 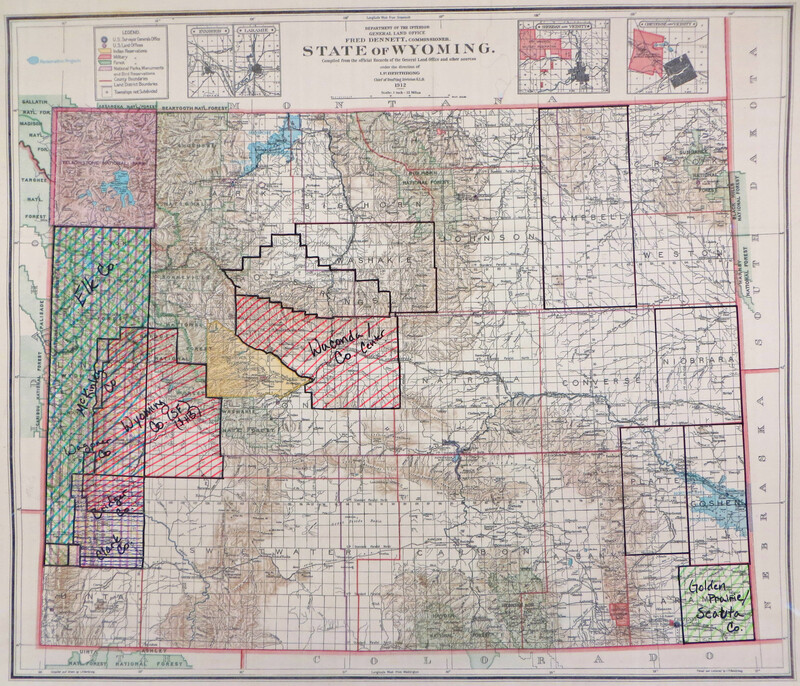 This was the largest group of counties organized at one time in Wyoming’s history. But the story starts a few years earlier…. The Legislature took Carey’s words to heart and 17 bill for the creation of new counties were introduced. A couple of the counties, like Hot Springs, had been narrowly defeated during the 1909 session and were nearly certain to pass during this term. In fact, Hot Springs, Platte, Goshen and Washakie Counties became Enrolled Acts 2, 3, 4 & 5. Campbell and Niobrara soon followed as Enrolled Acts 11 & 12. The majority of the division debate came during the discussion of if or how to divide Uinta County. In 1911, Uinta was the only one of the five original counties created in 1869 to retain its original borders, which stretched from the Utah border north to Yellowstone. It was also the largest of Wyoming’s 14 counties and thus a great candidate for division. Seven bills were introduced between the House and Senate proposing to create new counties out of Uinta County. All but two of these options stayed exclusively within Uinta’s boundaries. 1911 House Bill 198 “An Act creating and forming the County of Bridger…” Bridger County would have been created around the town of Kemmerer in what was then southern Uinta County. If the Evanston and Kemmerer newspapers are to be believed, this call for division of Uinta County blindsided many of the residents who remained opposed to the division. Opponents argued that the division was that the much smaller Uinta County would be unable to support itself and that all money the county had invested in road improvement would be lost. Proponents argued that it was nearly impossible for communities in the northern part of the county, like Jackson, to be fairly represented in county decisions due to their great distance from the county seat in Evanston. They also felt that the interests of the northern and southern portions of the county differed dramatically but that the larger population in the south eclipsed the voices of the north. Just days before the end of the session, it looked like the county would remain in tact and all crisis seemed to be averted. All 6 of the bills introduced at that point had been defeated. Then in the 11th hour, House Bill 203 passed, creating Lincoln County and reducing Uinta County to its current size. The Legislature passed several other bills relating to county organization and creation during the 1911 session. These bills called for the rewriting of the boundaries of the counties to reflect Federal land surveys and fast tracked the process of organizing new counties, among other things. One bill that did not pass sought to restrict the names of new counties to native words and names or to words reflecting the natural landscape. 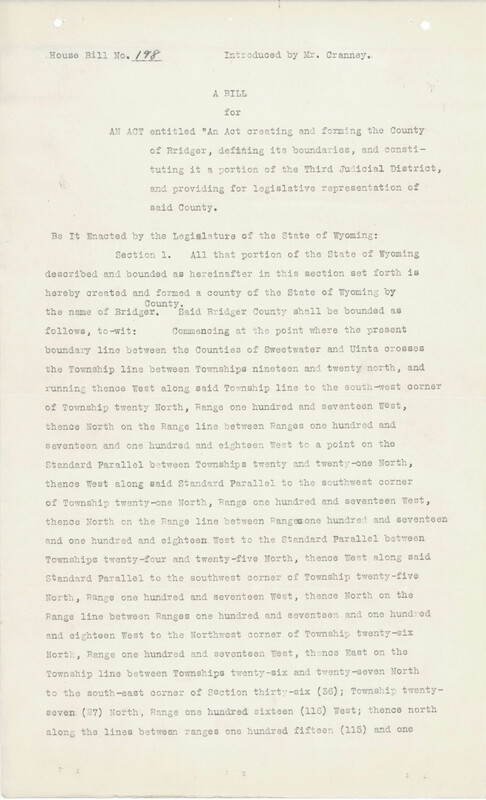 Several documents, including the unsuccessful bills to divide Uinta County, are currently on display in the Wyoming State Archives Reading Room in honor of Archives Month. 1. Wyoming’s population in 1890 was 62,555. By 1910, it had grown to 145,965. 2. Park County was created in 1909. 4. The bill for Goshen County originally called for it to be named Warren County in honor of Senator and former Governor Francis E. Warren. Likewise, Washakie County was to be called Hanover County. Thanks to an error by a Denver map company, there are maps that include “Hannover” County. 5. Waconda County was introduced as Senate File 101 and Center County as House Bill 59. Both used the same geographic boundaries and were essentially 2 bills for the creation of the same county. Both bills failed. 6.Wyoming County was introduced as House Bill 202 and Senate File 59 and included land within both Uinta and Fremont Counties. With a few adjustments, this area would be created as Sublette County in 1921.